It took Billions of years of evolution before complex life forms evolved from our planet, and it is only 200.000 years ago since homo sapiens showed up. Today we are facing a moment in time where we might take evolution into our own hands by developing technology like autonomous and intelligent machines that will release us from the burdens of Nature, like illness, labor and who knows even death. And when we think one step further this technology might determine its own future independent from its creators. All of this could happen in an unimaginably short time as the rate of development in the fields of artificial intelligence progresses exponentially. In the traceability of exponential developments, the human brain has always failed. At the same time our cognitive capacities seem to be getting more and more limited as the intelligence of our machines grows. What we humans can be sure of is, that we are the only living species on earth that could not have survived to this day without technology. From the cradle of humankind on, technology has always been a necessary tool to cope with a “non-paradisiacal”, hostile environment to survive. Today, we have reached the point where the entire existence of our civilization and species depends on the maintenence of technological Infrastructure, so that we can state, that we have entered a new phase of dependency. At the same time, this technology has become the new environment. Now we are faced with an entirely new kind of nature, in which biology and technology are intertwined and where human and nonhuman actors struggle for supremacy. This nature 2.0 isn’t just an update, it is evidently a fundamentally new situation, that once again challenges our existing civilization to undertake enormous adaptation processes. Beyond of the macro-economic revolutions such as those we call gobalization, we as individuals also are undergoing profound changes, that are reminiscent of our former situation when we had to protect ourselves from a “hostile” environment. Which tools are available to us now? 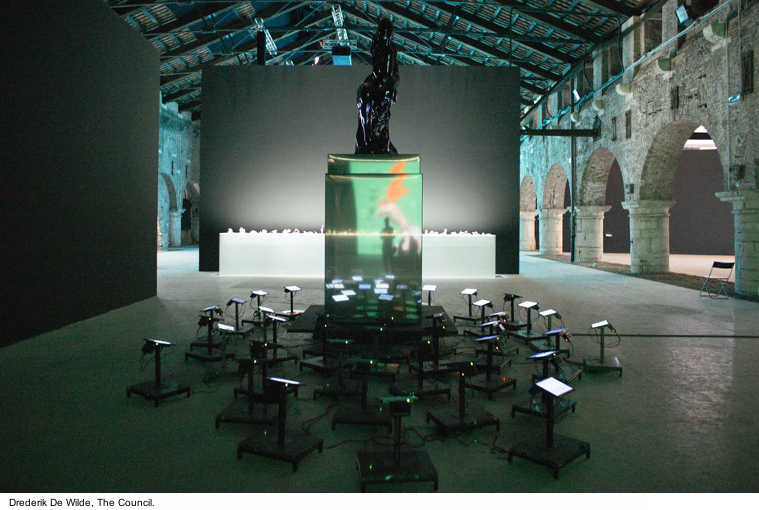 The exhibition A Beautiful Accident confronts us with the pressing topics we see ourselves confronted with while heading towards a nearby era where Artificial Intelligence and autonomous machines ruled by algorithms will become part of our lifes and our bodies. Different Ways to Infinity – DWI by Félix Luque Sánchez (BE), brings into experience – visible and audible – the metaphysical aspects of science. It shows us that dynamic and chaotic systems are constantly balancing between order and chaos, and that instability and unpredictability are as much part of much of our daily realities as of evolutionary processes. 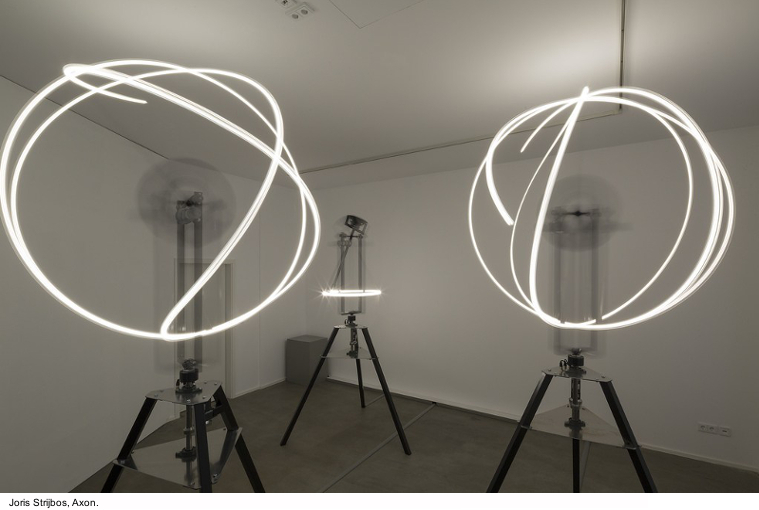 Axon by Joris Strijbos is reflecting neural networks as sequences of electrical impulses that according Jeff Hawkins, could eventually lead to the creation of autonomous and creative machines. 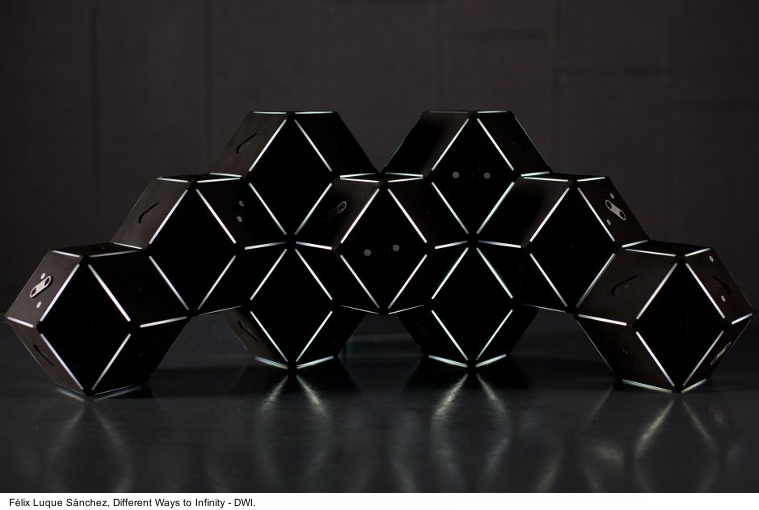 It is an audio visible work with 3 robotic sculptures that communicate with each other and their environment. The Council by Frederik De Wilde (BE) takes the sculpture Le Penseur by Rodin as the starting point of asking what the Thinker would be thinking about today. To answer this question De Wilde developed an AI and constructed a system that functions like a kind of hyper connected neural network, as we know it from our brains. Recursion by Sascha Pohflepp (DE) is a video work in which the artist developed an AI that had ‘to read’ texts about human biology, societal forms, some works on psychology, economics, emotion, science, technology, the human body and such. After this the AI was instructed to compose a text beginning with the word “human”. The performer in the video is reading the text composed by the AI: one of the questions addressed earlier in this text is what kind of technology is able to become intelligent or beyond? 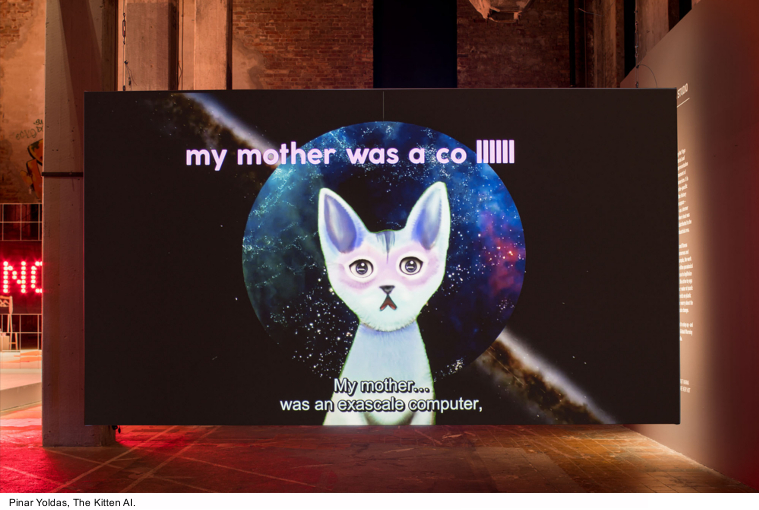 In The Kitten AI by Pinar Yoldas presents us a future where an AI (artificial intelligence) in the form of a sweet kitten has taken over government since our old European politics is to slow to deal with the pressing issues of today like environmental decline, economic uncertainties, social instability, and the unstable political situation worldwide generating endless flows of refugees. With Designer Babies, Pinar Yoldas further confronts us with the possibility that technology offers us today to enhance our genetic make up, in order to eradicate a particular defect, or to ensure that a particular gene is present. The Modular Body by Floris Kaayk (NL) takes this scenario even one step further and shows us the complex process of the creation of Oscar, an artificial life form that is built like a modular system where one can replace parts of the body when it breaks down. The project is a kind of documentary that involves us in all aspects of creating such life forms, ranging from ethics to our still limited understanding of the self. 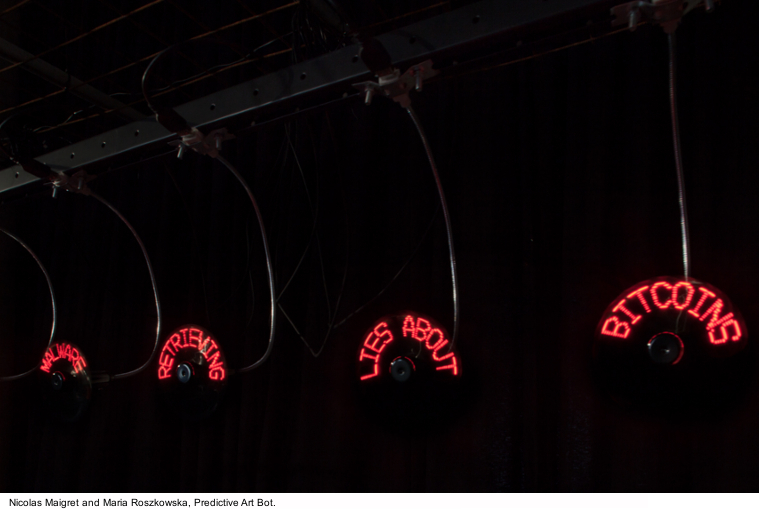 Imagining future artistic scenarios and topics is undertaken in the project Predictive Art Bot by Nicolas Maigret and Maria Roszkowska (FR) which is a playful critique on the promises of the use of algorithms to prevent potential crimes, and to make our life better and easier. For this project, they developed algorithms that suggest us artistic strategies for the future by monitoring the current debate on art, science and technology happening on the Internet (magazines, Blogs, etc.). The 5th Trondheim biennale, Metamorf 2018 – A Beautiful Accident – is aiming at a broad audience as well towards artists, designers, creators and thinkers. Together Meta.Morf wants to research, imagine and speculate on how we are looking at the future of mankind in the context of an overwhelming technological culture that hands us the tools for changing our future.